Major local employers including Hitachi Rail Europe, Circor Energy and Husqvarna are using new tailor-made apprenticeship programmes to help build their future workforces. Newton Aycliffe-based South West Durham Training (SWDT) is now delivering bespoke apprenticeship packages to accommodate the needs of businesses. SWDT says changes to the way apprenticeships are funded, and the apprenticeship levy, have created new opportunities to deliver a variety of programmes involving a range of different modules, as opposed to the standard, inflexible apprenticeship framework previously on offer. 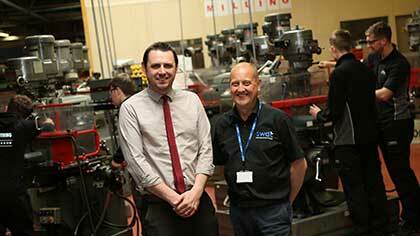 Chief executive Lee Childs, picrured (above, left) with higher education and BTEC co-ordinator Brian Corker, said: “As part of the changes to apprenticeships and the levy, the fact there’s more funding available creates more opportunities to make them more bespoke. “We’ve already discovered how we can adapt and make our apprenticeships more bespoke, but it also means we can build in extra training that’s needed for employers. “For us, the levy gives us more flexibility to get the most out of the funding available. Some of the learners working with SWDT include engineering technical support apprentices Connor Cockfield, 20, from Spennymoor (with Thorn Lighting), Jack McKenna, 17, from Spennymoor (Husqvarna) and Joel McLaren, 18, from Middlesbrough (Lear). Others studying engineering technical support in quality include Callum Atkinson, 19, from Chilton (Sabre Rail) and Ben Drewett, 17, from Wingate (Lear). SWDT is also working closely with Hitachi Rail, which is building the next generation of trains at its £82m rail vehicle manufacturing facility on Aycliffe Business Park, by providing training, while in December 2014 Hitachi Rail installed a £1m prototype train at SWDT to help train up staff before its new factory opened in September 2015. Callum Worrall and Ben Butler, both 21 and from Darlington (pictured below), have been with Hitachi since September 2015 while studying quality engineering technical support with SWDT. Ben said: “While working with Hitachi we do quality inspection. So as parts come in we check and inspect them against standards and either pass or fail them according to the standards.